A sparkling diamond solitaire, crafted in lustrous 18ct white gold with side diamond detail and a secret diamond inside the band. The Forever Diamond has a unique 73 facet cut, delivering exceptional sparkle and radiance. Each Forever Diamond has been independently certified by IGI for colour, clarity, carat and cut. 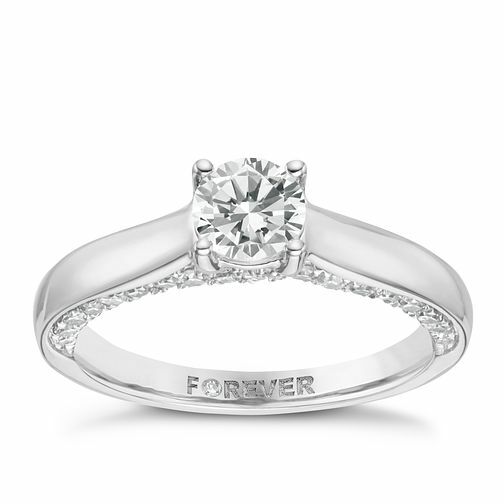 18ct White Gold 1ct Forever Diamond Solitaire Ring is rated 3.8 out of 5 by 5. Rated 5 out of 5 by Anonymous from Beautiful, perfect ring! Just exquisite! A very beautiful and sparkly ring, perfect for an engagement! Rated 5 out of 5 by Anonymous from Lovely sparkler Just bought this lovely ring the ring is in fact 1 carat in total for all the said diamonds thats the centre one and all the others absolutely stunning my fiance loved it.